Having previously lectured at University College Dublin, I joined the History Group at the University of Hertfordshire in 2013 where I am Reader in History. Between August 2016 and January 2019, I was Head of History, and I am now Associate Dean Education (Student Experience) for the School of Humanities. You can find the staff pages of my History colleagues here. This first detailed examination of Irish women’s magazines challenges the assumption that such publications were concerned only with the domestic and that they perpetuated traditional notions about the role of women. The 1960s was a decade of transformation in Ireland, when the country began to consider itself ‘modern’. As the economy improved, an air of confidence was noticeable. A new generation of women began to question traditional roles and expected more from their lives. 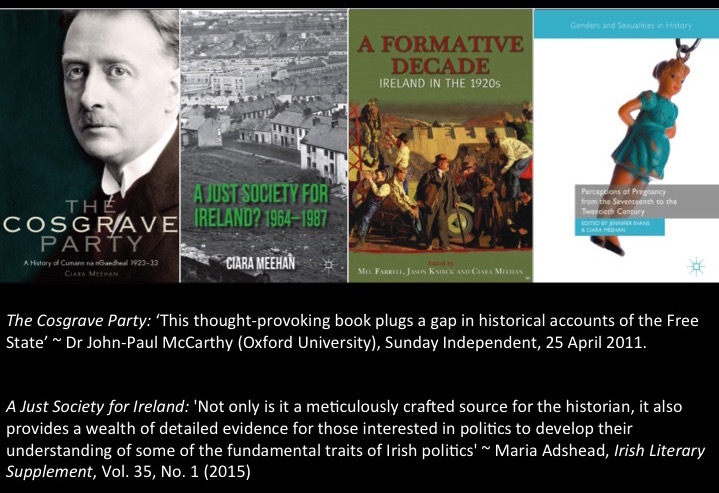 But traditional values persisted for an older, more conservative generation that struggled to locate their place in a changing Ireland. This tension between old and new is identifiable in the pages of the magazines. They published seemingly contradictory messages, but, rather than suffering from an identity crisis, what they were actually doing was providing a platform for as yet uncrystallised ideas to be laid out, analysed and generally made sense of before they became part of mainstream politics in the 1970s. Although pointing out injustices in society, crucially the magazines never criticised women being in the home. Instead, through the publication of positive stories, they attempted to show women that it was possible to augment or transform their position in society. The monograph is preceded by a touring exhibition, Modern Wife, Modern Life, which has attracted extensive media interest. I am the co-organiser (with Owen Davies and Ceri Houlbrook) of Electric Generations. This touring exhibition shows how the reception and understanding of electricity by different generations varied across the twentieth century, reflecting the shift from an unfamiliar power to a fundamental feature of everyday life. It begins by exploring how people initially feared that this new power could be harnessed to cause harm to neighbours and enemies. The next section focuses on the campaign for popular acceptance of domestic electricity. The final section illustrates how the electrical home was marketed as desirable and empowering for women. This story of the electrical transformation of Ireland is illustrated through inter-generational responses and the experiences of the diaspora in Britain, offering visitors an insight into the similarities and differences in the timelines of electric innovations and consumption in both countries. The exhibition has visited dlr LexIcon in Dún Laoghaire, Ireland, the University of Hertfordshire, and the Irish World Heritage Centre in Macnhester. It features previously unseen material from ESB’s Archivesand the Institution of Engineering and Technology archive. Electric Generations is a collaboration between members of the History Group and ESB Archives, in association with IET Archives. It is generously funded by the University of Hertfordshire, with additional financial support from dlr LexIcon. Research blog and twitter account. Modern Wife, Modern Life exhibition website and twitter account. 'Making a Historical Documentary': Giving Students the Technological Skills to Communicate their Research. Article in Sunday Business Post reflecting on the life of Liam Cosgrave.